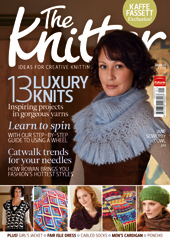 Lazyblog@Lazykate: My article in The Knitter !! I'm so pleased to be able to share at last that my article Spinning Yarn on A Wheel - A Spinning Masterclass has been published in the current issue of The Knitter! The article takes you step by step through the parts of the wheel, choosing fibres and then spinning through from drafting to plying. This is a first for me and I thoroughly enjoyed every minute of the process, I suppose because I love spinning so much, the opportunity to write about it was just wonderful! I think I will be unbearable to live with over the coming weeks. I bought three copies in WHSmiths today (taking the cellophane off the magazine to have a nosey before I bought it). I thought the shop assistant was going to take me outside and have me shot! I bought a copy for my myself, my mum and my nan, the circulation of The Knitter could rise considerably just with sales for my family alone. Anyway, onto other things, a little while ago I posted A Waste Dye Dilemma post. Wasting dye is something that does bother me, so I did a little experiment and dyed these fibres. I'm really pleased with it, it has a beautiful sheen, which I think shows up well on the photo, and I've started knitting it for my Baker's quilt, which is coming on a treat. I'm really enjoying it and can knit while looking up sometimes (at the telly). I believe that makes me practically professional. Or something. Congratulations on the article! It's great to see spinning brought to a whole new audience. I'll pick up a copy today! Congratulations! And I love the yarn that came from your experiment. I saw that bee-keepers quilt recently and was coveting it but I am definitely a very new knitter, I can't look at the TV without dropping 10 stitches, so that makes you a pro in my eyes! Thank you both, I agree about spinning getting to a new audience, I'm sure knitters would fall in love with it. I gave up with the Beekeepers Quilt, maybe I'll try again in a few years, in the meantime I'll stick with my little squares!